More and more consumers in China are using mobile phones to purchase products. Products sold by major platforms are able to deliver products at the very next day. There are two ways of selling imported products online in China. Export products into China through conventional distribution channels and list those products online (B2B2C) — Major web platforms such as jd.com, Tmall (except Taobao) and Amazon China require customs paper and manufacture authorization letters to be able to list imported products on those web platforms. Sell products on cross-border web platforms — inventory products either at local overseas warehouse or China Free Trade zone area. Because more and more counterfeiting products are discovered in China, the second method recently becomes much more attractive to Chinese consumers. 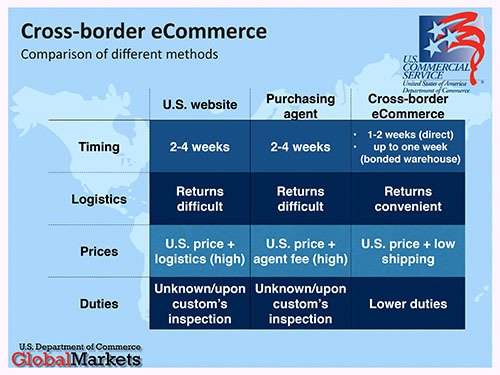 Not all businesses in China are allowed to provide Cross-Border E-Commerce services. By the end of 2015, businesses in 8 cities in China are able to start cross-border e-commerce — Shanghai, Chongqing, Hangzhou, Ningbo, Zhangzhou, Guangzhou, Shenzhen and Tianjin. Products imported have no Value-Added taxes. Certain categories like baby and cosmetic products have lower barriers to be entered into China market compare to traditional online retail. Faster China Customs clearance and inspection — only several days. Web platforms are registered and products are pre-approved by China customs, no counterfeiting products. Tobongo, our China online web platform, is registered with local customs in both Hangzhou and Shanghai China with warehouses inside of Free Trade Zone.